BabyBlueOnline: Rock of Ages and Happy Thanksgiving! Rock of Ages and Happy Thanksgiving! BB NOTE: Here's an article from today's edition of The New York Times (tip of the tinfoil hat to Karen - thank you!) 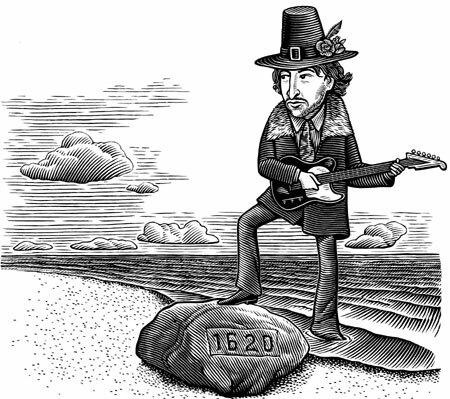 on Thanksgiving, Plymouth Rock, and Bob Dylan. Nathaniel Philbrick catches on to the sly humor of his bobness and the article does what a Dylan song does - takes you down one road, doubles back, reinvents itself, and packs an unexpected zinger in the end. Have wondered about those outfits the band has been wearing - thinking it was more an ode to Charlie Chaplin, but the Pilgrims - now that's a pip. It's always great to read articles like this - which go beyond the usual "why can't he sing" cliche and gets it. Thanks, Mr. Philbrick. And Happy Thanksgiving everyone! LAST week, I went to see Bob Dylan at the Nassau Coliseum. It turned out to be a terrific rock ’n’ roll show. I must admit, however, to being somewhat distracted by how Mr. Dylan and his band were dressed. They wore hats and rather elegant suits, and it was in the midst of “Like a Rolling Stone,” as Dylan stood before the keyboard howling out the refrain, that I had what I’ll call a Thanksgiving epiphany. I don’t know if it’s because I’ve spent the past four years researching the history of Plymouth Colony, but at that moment Mr. Dylan and his band reminded me of the Pilgrims. Not the actual Pilgrims, but the cardboard caricatures we come to know in elementary school, dressed in dark suits, with buckles on their hats and shoes. It was then that I remembered that almost precisely 31 years before, in 1975, Bob Dylan launched his legendary Rolling Thunder Revue in, of all places, Plymouth, Mass. No one living has a better appreciation for the sneaky and unnerving power of American myth than Bob Dylan. In the fall of 1975, the United States was gripped by what the playwright Sam Shepard, who had been hired to work on a film about the tour, called “Bicentennial madness.” With 1976 fast approaching, America was obsessed as never before with its origins, and as Mr. Dylan knew perfectly well, there was no better place to launch his tour than the mythic landing ground of the Pilgrims. Mr. Shepard did not end up contributing much to the film, but he did publish a log chronicling the tour’s first six weeks. Included in the book is a bizarre photo showing Mr. Dylan and several fellow musicians peering over the side of the Mayflower II, a reproduction of a 17th-century vessel berthed at Plimoth Plantation. A stiff breeze is blowing, and two of the party are desperately hanging on to the brims of their cowboy hats as the front man of the Byrds, Roger McGuinn, speaks on a huge, ’70s-style portable phone. But perhaps the weirdest and wackiest portion of Mr. Shepard’s log describes how Mr. Dylan and his pals recreated the landing of the Pilgrims at Plymouth Rock. As the poet Allen Ginsberg sat beside the iron fence that surrounds the rock, chanting and chiming his set of Tibetan bells, Mr. Dylan haphazardly piloted a dinghy to the Plymouth shore. Last week at the Nassau Coliseum it occurred to me that Bob Dylan is a lot like Plymouth Rock. Just as he emerged full-blown onto the New York folk scene of the 1960s, claiming a shadowy and, it turned out, apocryphal past, so did Plymouth Rock suddenly come to the attention of the American people in a manner that smacks of dubious self-invention. There is no reference to a rock in any of the Pilgrims’ accounts of their arrival in Plymouth Harbor. Not until more than a century later did 95-year-old Thomas Faunce claim that his father, who did not arrive in Plymouth until three years after the Pilgrims, told him that the Mayflower passengers first stepped onto an undistinguished boulder at the edge of Plymouth Harbor. Thus was born the legend of Plymouth Rock. Before the American Revolution, a group of patriots known as the Sons of Liberty seized upon the rock, literally, as a symbol of the unyielding righteousness of their cause. They decided to move the rock from its original location at the edge of the harbor to the center of town. Unfortunately, as the Sons of Liberty extracted the rock from the sandy muck of the harbor, it broke in half. Leaving the presumably Loyalist half behind, they carted their half of the rock to the town square. Decades later, the rock was moved to a different part of town, only to be dropped once again and broken in half. All this time, souvenir hunters had been picking away at it. By the time the two quarters were reunited with the piece that remained at the edge of the harbor, around the time of the Civil War, the total size of the rock had been diminished by approximately half. Today, the ornate granite edifice that enshrines what’s left of Plymouth Rock serves only to mock what is now a virtual pebble with a cemented seam running across it. Mount Rushmore, it isn’t. Indeed, Plymouth Rock has been deservedly called the biggest letdown in tourism. And yet the rock is, as far as I’m concerned, a wonderful metaphor for what we Americans do to our history. We slice it, we dice it, we try to put it back together again, but in the end it is just there: a sadly diminished thing that, despite all the abuse we have heaped upon it, retains an enduring connection to a past we can never really hope to recapture. Bob Dylan is a legend who has received his own share of knocks — whether it be from acoustic purists at the Newport Folk Festival or from his own motorcycle. Last week at the Nassau Coliseum, he proved that no matter what the passage of time and the constant touring have done to his vocal cords, he can still deliver songs like “Highway 61 Revisited” and “All Along the Watchtower” with a feral abandon that has grown only more powerful with the years. And so, on this Thanksgiving Day, I am going to give thanks not only for turkey, family and football. I am going to pay homage to the staying power of two American icons, Bob Dylan and Plymouth Rock. Still being used years later! George Carey: "I Support Rowan"
Jay Slocum on Time: "Learning to Number Our Days"
"What are you, a Unitarian?"